Southwold, Suffolk family brewer Adnams is for me, like Harveys of Lewes, a beacon for traditional British brewing, its values embodied in its accomplished, highly individual beers. Unlike its Sussex rival, Adnams has taken a decidedly entrepreneurial attitude to its business in recent years launching not only a range of special brews (including continental styles such as a Cologne-style Kölsch and a Dutch-style bokbier) but now also distilling some accomplished spirits, too. Adnams has also begun opening its Adnams Cellar & Kitchen stores further afield, taking the company’s own beers and spirits, plus an extensive range of wines (Adnams has long been a wine importer and merchant, even if it hasn’t been well known as such) and kitchen goods outside its East Anglian homeland. Two such outlets – both recently opened – are in central and east London, respectively in Store Street near the British Museum and in Brushfield Street, abuted to the rejuvenated Spitalfields Market and near to the bustling Brick Lane. With the former being situated near my workplace and the latter near the mainline railway terminus I use to go home (Liverpool Street) it was only a matter of time before I got around to visiting both. And very worthwhile visits they proved to be. 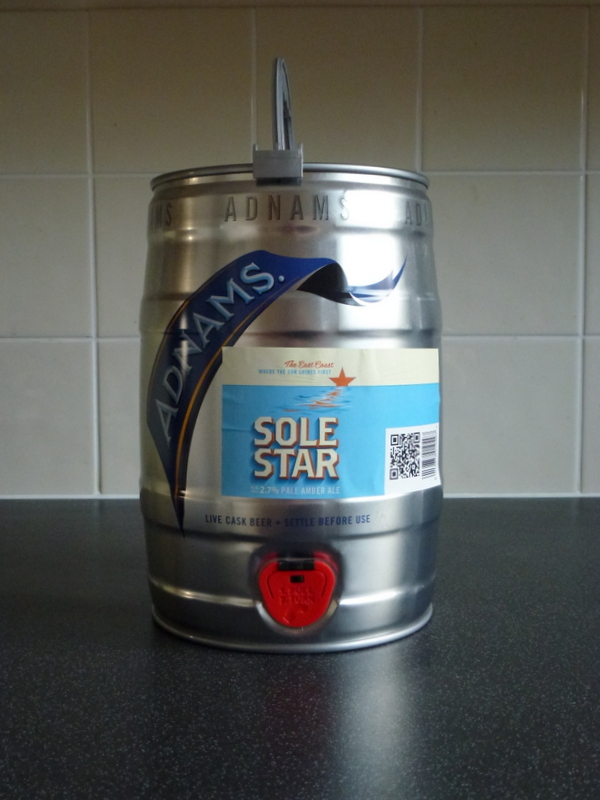 The first, to the Store Street store, saw me heading home with an eight pint mini-cask of a new, and unexpected, Adnams beer, Sole Star. This new 2.7% bitter is another example of the trend towards low alcohol yet big-flavoured ales that I’ve explored a couple of times before in these pages. And quite a successful one it is too, with big earthy hops, subtle caramel malty flavours, a healthy amber hue and the unique flavour stamp of Adnams’ yeast combining to overcome the unavoidably slightly thin body inherent in these brews. However, the fact that Sole Star can still taste as much like a hand-pulled Adnams cask beer as it does indicates that appearances can be deceptive. Indeed, the atomisation of essential oils releases a massive hop aroma that will be hard to replicate in the cask version, although I’m very much looking forward to trying that too. 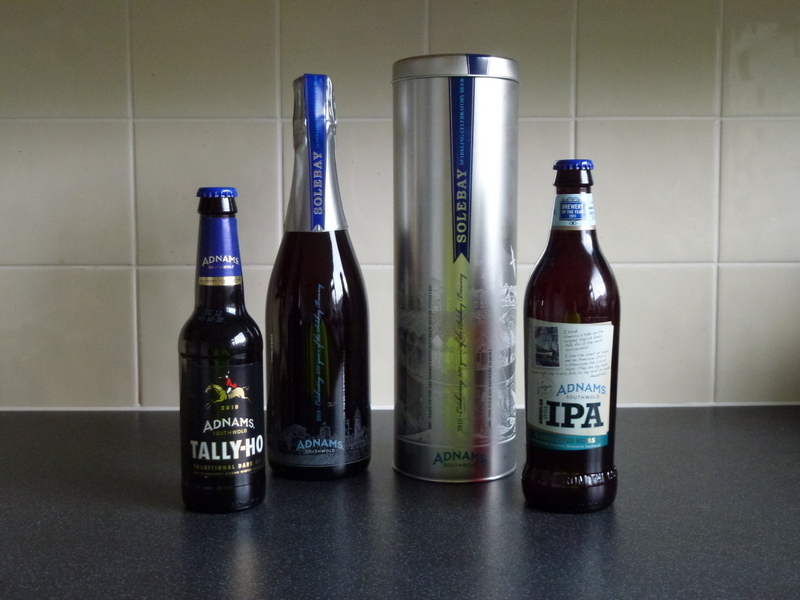 Having not had room to fit anything else into my backpack beyond the mini-keg, I used that as an excuse to visit the second of Adnams’ London stores, in Spitalfields, a few days later. Having intended simply to pick up bottles of Adnams old school Tally-Ho barley wine (7.2%) and its unusual Champagne-bottled, sparkling Sole Bay Celebratory Beer (10%) (I also ended up with a bottle of Adnams American IPA, 6.8%), I started chatting with the knowledgeable and helpful staff about Adnams’ venture into distilling (The Copper House Distillery was set up next to the brewery in 2010) and its plans for a new English whisky. Or is that whiskey? I’m not sure that new wave English whisky makers yet have a convention on spelling in the way established whisky nations have (as such I think I’ll stick to “whisky” generically for now, unless a distillery itself uses the alternative spelling) but either way Adnams should join the excellent St George’s Distillery in neighbouring Norfolk and the combined efforts of the St Austell Brewery and Healey’s Cyder Farm – whose Hicks & Healey Cornish Single Malt Whiskey is much harder to get hold of – as a seller of English whisky sometime before the end of 2013, after the spirit has spent the required three years minimum in oak barrels. For those who don’t know, any spirit labelled as whisky in the UK must have spent a minimum of three years in oak barrels before the term can be applied to it. This makes whisky distilling a difficult and expensive market to enter successfully as new producers are effectively unable to sell their products during that period, leading to potentially fatal cash flow crises. With that restriction in place, Adnams, as with many other new whisky distillers, has taken advantage of the fact that the same equipment can also be used to make gin, vodka and other white spirits as well as spirits-based drinks such as liqueurs to which similar restrictions don’t apply. And similar spirits can also be made that have seen the inside of an oak barrel for shorter periods of time providing that legally defined terms such as “whisky” are not used as labels. With its true whisky currently sleeping, Adnams has also explored quicker forms of oak barrel ageing in its North Cove Oak-Aged Vodka, a generous sample of which I’d been handed in the Store Street store. The use of new oak barrels to accelerate wood ageing of spirits is something I’m used to from its common application in the ageing of tequila but the use of the technique on grain spirits isn’t something I’ve experienced before. The technique adds both depth and a little spice to North Cove in what must be a very short wood exposure and raises the spirit to new levels of complexity that demand a rethink as to how it is best imbibed. It can easily stand its ground without a mixer, although in truth that should really be true of any good quality vodka. Suffice to say North Cove is safely that. An indicator of how good we can expect Adnams whisky to be? That too, probably. My sampling of North Cove impressed me enough to put it on my list of future acquisitions. But that may now have to be placed on hold as Adnams cues up another aged grain-based spirit – and a further prelude of sorts to its whisky – in the form of Spirit of Broadside, a pre-release sample of which was magicked out from under the counter in a rather desirable presentation box but not, unfortunately, for sale. Described as an “eau de vie de biere” after a continental European practice, Adnams latest brown spirit is distilled from the strong (6.3%) version of its well-known hoppy and big-flavoured special bitter, Broadside. Unlike most of its European cousins – and perhaps counter to its eau de vie description – the spirit will, in its release version, have spent a year in heavily-toasted new Russian oak barrels, further accelerating its maturation. Set to be launched commercially in mid-May, even the pre-release sample of Spirit of Broadside I tried demonstrated the profound effect that new oak has on white spirits in a very short space of time, offering an almost cardamom-spicy nose and palate quite unlike anything I’ve tried before. Given an additional 18 months in barrel there would be no obvious reason, except tradition, not to regard Spirit of Broadside as whisky, atypical as it might be, as whisky. After all whisky – as is also the case for much vodka – is essentially distilled beer, albeit not usually hopped beer. But for now Spirit of Broadside deserves to be thought of as a unique product in its own right. At a time when much of the noise in brewing and distilling is focused on new wave, often small producers with little history, Adnams deserves enormous credit for innovating rather than relying solely on its reputation as a traditional brewer. 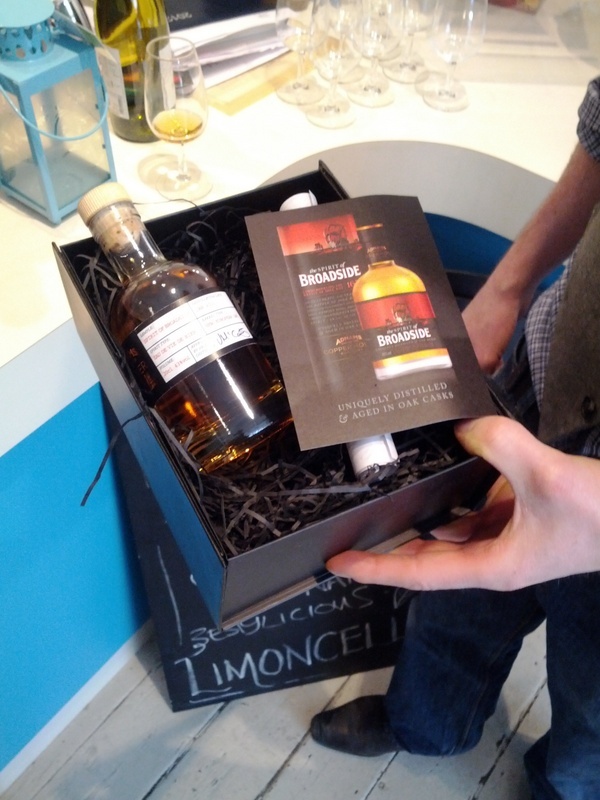 I’ll be at the front of the queue for a bottle of Spirit of Broadside and again when Adnams’ first whisky is released. BTW does anyone want to write on Adnams and other new British gin producers for me as a guest Tippster? New gins are a significant and fascinating trend right now but my taste buds don’t really allow me to do them justice.